These two powerful classics of ancient drama are excellent examples of the author's gift for adapting traditional material for decidedly nontraditional effect. Through them Euripides critically examines social and moral aspects of contemporary life and even specific political events. He endows his figures with shrewdly observed individual character, implicitly deflating the emblematic simplicity of traditional narratives and making him seem the most modern of the great Greek dramatists. 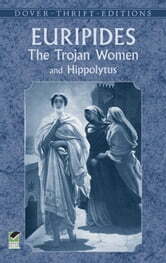 The Trojan Women, one of the most powerful indictments of war and the arrogance of power ever written, is played out before the ruined walls of Troy. A grim recounting of the murder of the innocent, the desecration of shrines, and the enslavement of the women of the defeated city, it reveals the futility of a war fought for essentially frivolous reasons, in which the traditional heroes are shown to be little better than bloodthirsty thugs. Hippolytus is primarily about the dangers of passion and immoderation, whether in pursuing or in thwarting normal desires — struggles symbolized by the gods, who embody natural forces and behave like irresponsible humans. Required study for any college course in literature and mythology, these two masterpieces are essential reading for anyone interested in the roots of world drama.